CSX maintenance repairs caused a morning gridlock in Gibsonton during the morning commute as drivers were stuck getting out of their own subdivisions on Thursday. 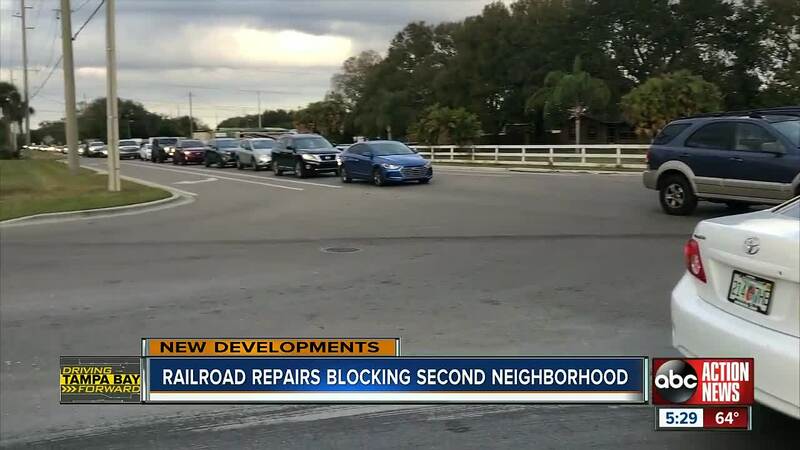 GIBSONTON, Fla. — CSX maintenance repairs caused a morning gridlock in Gibsonton during the morning commute as drivers were stuck getting out of their own subdivisions on Thursday. Symmes Road and US 41 has been shut down for days now, and its caused a gridlock for miles along this main road for some. The Carriage Pointe Subdivision has only one main road, Symmes Road, to get in and out of their subdivision. "We need back roads," uttered Kelvin Johnson, as he sat frustrated in the traffic. The worse part for him was the trickle effect the closure had impacting transportation for school buses. "We stood out in the cold for about 45 minutes waiting on the bus," said Johnson. CSX has been doing maintenance repairs on miles of railroad tracks along US 41 in Hillsborough and Pasco counties. The work in Hillsborough County has been completed to the north, but they still have upcoming closures in the southern part of the county. A map provided to ABC Action News shows the closures that have been completed, and still expected. The red boxes are still anticipated closures, and the green closures are in the works, or have been completed. The dates may also be a few days off depending on weather, and the delay of other closures. The Gibsonton area can expect two more closures in the coming days. CSX was supposed to shut down Riverview Drive, but a spokesperson tells us they have had to delay that project because a change in the traffic pattern would not work at this time. They also added that they can not do the work at night because of safety concernsdue to how dark it is along the tracks, and how mobile the crews are. The county tells ABC Action News they don't expect any other closures to cause the traffic backup like Symmes Road.